Pick up ONLY, Price does NOT include delivery, call for delivery cost. Super Special purchase, Super bargain shed, Durabuilt EasySHED kit shed. SHED COMES WITH A DOUBLE DOORS. Limited time, limited quantity, 10 only at this price. Shed in stock, and available for immediate pick up. This quality Australian made shed comes with 20 year manufacturer's warranty. Available in Mist Green only. Available for pick up only. The shed measures 4.50m wide x 3.00m deep, when erected, and has a front wall 1.80m high, the height at the peak of the roof is 2.10. The RRP for this shed in Colorbond is $1789, 10 only are available. Shed is available for pick up on order from Garden Sheds Galore in Cheltenham, local Melbourne delivery can be arranged. Other options are available for this shed such as timber floor, lock handle, shelves, skylights, etc, for additional cost. The Shed is also available in Zincalume and 23 other colours, additional charges, (regular retail prices) apply. This special available for a limited time only, 10 only available, Don't miss out, Call 9583 3944 order your shed now! Pick up ONLY, Price does NOT include delivery, call for delivery cost. Super Special purchase, Super bargain shed, Durabuilt EasySHED kit shed. SHED COMES WITH A DOUBLE DOORS. Limited time, limited quantity, 10 only at this price. Shed in stock, and available for immediate pick up. 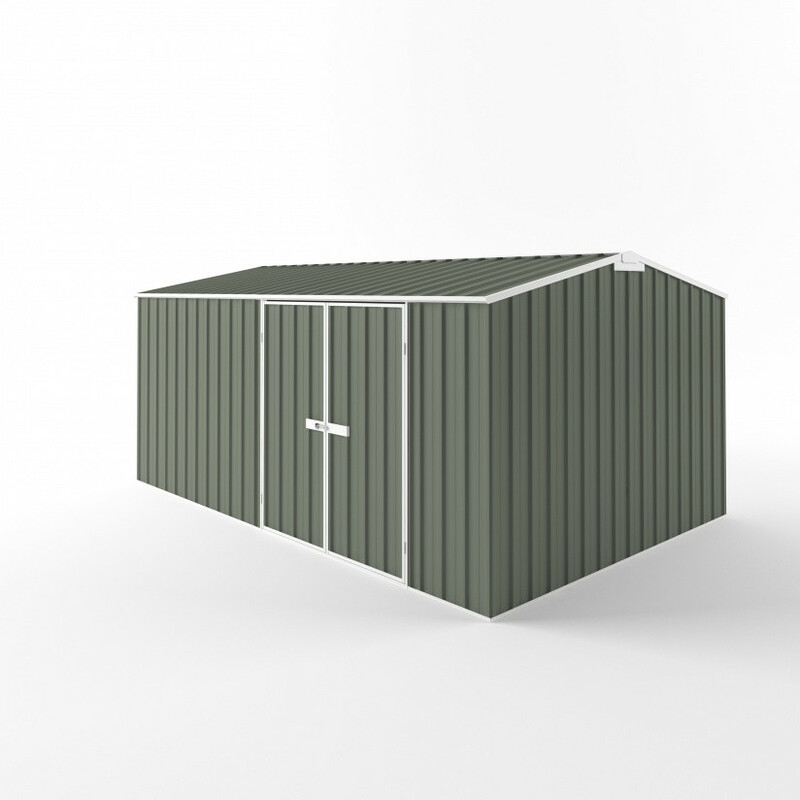 This quality Australian made shed comes with 20 year manufacturer's warranty. Available in Mist Green only. Available For pick up only. The shed measures 4.50m wide x 3.00m deep, when erected, and has a front wall 1.80m high, the height at the peak of the roof is 2.10. RRP for this shed in Colorbond is $1789, 10 only are available.